CEO Mike Jackson received $1.25 million in base salary, up from $1.15 million a year earlier. 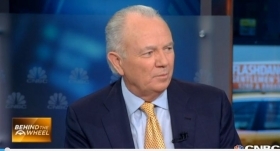 AutoNation Inc. CEO Mike Jackson’s overall compensation soared 69 percent to $10.6 million for 2014, up from $6.3 million for 2013, AutoNation said in its proxy filing released late Thursday. Other top executives at the nation’s largest dealership group saw their total compensation rise between 16 and 67 percent, as performance bonuses kicked in, particularly in the form of stock options. In 2014, AutoNation’s net income rose 12 percent, and its operating income rose 11 percent, on a 9 percent gain in revenue. Adjusted operating income per share, one of the metrics used to determine executive bonuses, rose 17 percent. Mike Maroone, who retired from his position as COO on April 1, saw his total compensation for 2014 surge 67 percent to $8.5 million. Most of the increases came from option awards and the company’s nonequity incentive plan compensation. For example, Jackson received $1.25 million in base salary, up from $1.15 million a year earlier. In addition to his salary, Jackson received $7.1 million in stock options, more than double the $3.3 million he received a year earlier, and $2.1 million in nonequity incentive plan compensation, up from $1.6 million. Jackson also received $163,654 in other compensation, including items such as aircraft and vehicle allowances, down slightly from $164,951. Maroone’s option awards also more than doubled, to $6 million from $2.7 million. Jonathan Ferrando, executive vice president in charge of the company’s general counsel, corporate development and human resources, received a 45 percent increase in his overall compensation, to $4.4 million. Total compensation for Cheryl Scully, who was named AutoNation’s CFO on March 3, 2014, came to $2.8 million. Year-earlier figures were not given because she was not an executive officer in 2013. Alan McLaren, senior vice president for customer care, received total compensation of $1.4 million, up 16 percent.